Hope you are having a great Saturday! We have a very relaxing weekend for a change. All my classes and clubs are done until the new year. We have one last soccer game and a birthday party and that's it for the weekend! Woohoo! Looking forward to some downtime. 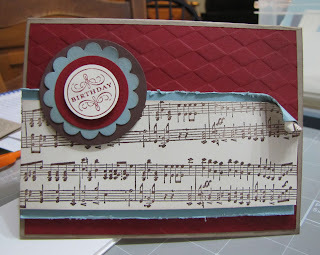 Today I have a card to share that one of my good friends - Colinda Sanchez made. She needed a musical birthday card and this is what she created. I love how it turned out! Have a wonderful day and weekend! Can you believe Christmas is in just over a week!